Last night and this morning I was busy painting my upstairs bathroom. While I am a all for the new and modern, I am a huge fan of the vintage. My love of Victorian aesthetics, my interest in burlesque and my obsession with the kitsch play into how I am decorating my home. Although not a selling point like the huge kitchen and the fireplace, I fell in love with my upstairs bathroom as soon as I saw it. It is full of 50’s adorableness. 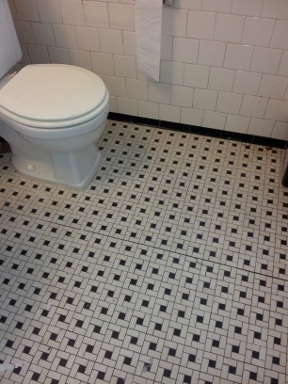 The black and white tiles on the floors and walls were just perfect. Aren’t those tiles just darling? When I moved in, the walls and ceiling were primed and it looked like they were dark blue. Since it is a small bathroom, I wanted something brighter. I loved the monochrome tiles, so I decided to paint the ceiling white and the walls grey. So I got some semi-gloss, procrastinated for several weeks,painted the ceiling, procrastinated even more, and got around to painting last night. Two coats of paint later, the walls were a medium grey. I found some great white wicker shelves at a Goodwill a while ago. Before they were used to hold my craft stuff, but now they are stationed in the loo and look wonderful. Black and white and grey all over. I also replaced the light fixture. The one that was there looked vintage, but I didn’t like the exposed bulbs because I use CFLs and that would look silly. I found the perfect new fixture in the ReStore for $2, but it did not come with the sconces, so I got some nice fluted ones for $1 each there too (for more information, see this post). It was girly and vintage and awesome. So I just turned off the power and put up the new fixture in about 5 minutes. Isn’t it cute? 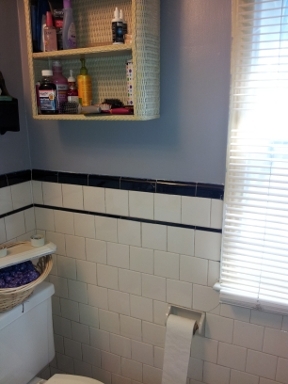 So, about 3 hours of work, my bathroom has a new look. All that is left is to make some nice vintage-y monochrome curtains to complete the look.